After all these years the hollow and shallow Ex Servicemen Society and gentlemen mentioned below have damaged Pakistan beyond repair these damages cannot be undone only through apology. They should be tried for treason under Artcile 6 of 1973 Constitution and that is the only remedy. Have you noticed the height of arrogance and emptiness in our Praetorian Guards. Even after so much damage they are arrogant to the core. 6. (1) Any person who abrogates or attempts or conspires to abrogate, subverts or attempts or conspires to subvert the Constitution by use of force or show of force or by other unconstitutional means shall be guilty of high treason. (2) Any person aiding or abetting the acts mentioned in clause (1) shall likewise be guilty of high treason. (3) [Majlis-e-Shoora (Parliament)] shall by law provide for the punishment of persons found guilty of high treason. An accomplice is a person who actively participates in the commission of a crime, even though they take no part in the actual criminal offense. Watch! How shamelessly Lt. General (R) Hamid Gul admitted his violation of 1973 Constitution of Islamic Republic of Pakistan - DO TOK with Mazhar Abbas: AUG 29 ‘09Gen. 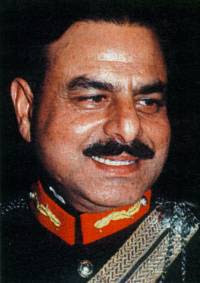 (R) Hameed Gul (Former DG ISI) gives his candid views on his roles and on ISI’s history, its role in national politics.